Mouse your way to better comfort with an ergonomic hand accessory that can really change up the game at work. Prevent repetitive stress injuries easily with the addition of the Ergonomic Mouse by Goldtouch and relax as you work, starting with your hands. The Ergonomic Mouse's beautifully contoured design banishes muscle fatigue, letting you focus for hours without pain or strain. I am right handed but use a left handed mouse to save my arthritic right hand from extra stress. (I also cannot use a mouse like the Roller Mouse or joystick where thumb action is required.) I've tried several types and this is the one I like the best. It's a very natural fit for my hand - I wear a size M to L women's glove. I have the same mouse at work and home and that helps me use it more effectively. It only requires a light touch. It does take a while to get used to any mouse, but after a week or so it was totally natural. I am left handed and like the mouse. I am not petite but I do not have large hands either. It fits fine. Sometimes I find myself bearing down a little heavy but it is out of habit and is not necessary. Sadness sums up my feelings about this mouse. I bought the rather expensive Bluetooth version of the Goldtouch ergonomic mouse and was super pumped while I waited for it to arrive. I have been combing the interwebs looking for a wireless mouse (so I can change up my arm position and reduce shoulder strain), with a good angle and palm support (to reduce my wrist swelling), and with low click force buttons (to help with the muscle spasm in my forearm). 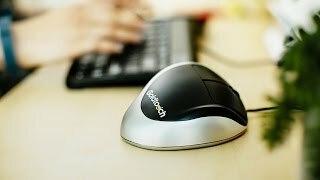 The Goldtouch mouse sounded perfect! Alas, it was not. This is one HUGE mouse you guys. Admittedly I have small hands. My hands are 6 1/2 inches long from my wrist to my middle fingertip and are 3 inches wide (excluding my thumb). Goldtouch made much of how the version 2 mouse fit a variety of hand sizes, but let me tell you, it does not. The angle and the click force are both nice enough. I like being able to click with my whole finger instead of just my fingertip. It's the scroll wheel that's the problem. I can't reach it. My fingertips end a quarter to a half inch away from it when I rest my hand on the mouse, which means I have to pick up my hand and contort my fingers to scroll. Misery! I might as well keep using my Apple magic trackpad since I no longer have any hand support or proper angling. To make matters worse, even if my hand were large enough for this mouse, I probably still wouldn't like the scroll wheel. It's tiny and not very precise, which means it requires fine motor skills. That's a dealbreaker for those of us with RSI I'm afraid. My search for a comfortable mouse continues!